Home > International Conference > Out for Business! 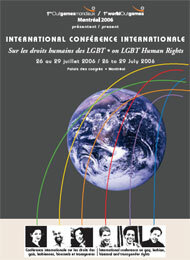 Already an important partner in the 1st World Outgames and actively working with the Montréal 2006 Organizing Committee since the project’s inception, the Québec Gay Chamber of Commerce – CCGQ was given the mandate, within the framework of the International Conference, to develop a specific section targeted specifically at chambers of commerce, professionals and business associations in the international LGBT community. Developing its international network which already had a solid base in Canada, the United States and in Europe, the CCGQ has formed a Steering Committee composed of representatives from eleven organizations in six countries. By the end of 2005, the Steering Committee will propose an internationally-renowned keynote speaker and determine the program, the content of the workshops and the conferences aimed at professionals and business people. Come back regularly to get all the latest news! “Out for Business!” will be presented from 26 to 29 July 2006, at the Palais des congrès, Montréal’s Convention Center. It will definitely be a not-to-be-missed occasion where more than 300 professionals and business people will discuss important issues for the LGBT community worldwide. Hope to see you there! One of the CCGQ’s mandates for the Conference is to further develop its international network, which already has a solid base in Canada, the United States and in Europe. To do so, an International Steering Committee has been set up by the CCGQ with the responsibility of proposing an internationally-renowned keynote speaker and building a full program of workshops and conferences for “Out for Business!”. The Steering Committee is also responsible for engaging professionals and business people from all around the world and generating at least 300 registrations for the International Conference. M. Thom Cardwell, Co-Founder and President, representing the Greater Philadelphia Professional Network, from the United States of America. 14:00 - 17:00 Plenary Session: Workers Out! The Opening Session of Out for Business will focus on how LGBT chambers of commerce and business organizations can work together to create positive change around the globe. The panel will also address how to increase business development opportunities for LGBT business owners and entrepreneurs throughout the world. The panel will discuss the role that an official international organization could play and how best to establish cooperation among the various organizations that would make up this international body. This session is designed to educate LGBT business owners and entrepreneurs about financing options to start or grow their enterprise. Whether you are looking for start up capital or for capital investment to expand existing operations, this session will benefit you. Delegates will use this opportunity to share program and event ideas with one another and share best practices. This session will allow attendees to capitalize on one another’s successes and help ward off potential failures. If you are part of a chamber or business organization that is attending this session, be sure to plan ahead and bring your materials and resources to share! This session will give a global perspective on what multinational corporations are doing to ensure equality in the workplace. Find out what companies are doing to support the LGBT equality movement as a part of good corporate citizenship though partnerships and organizational involvement. You will also hear how companies mesh their corporate LGBT diversity philosophies with laws and social mores in the various countries in which they do business. This panel explores why being OUT and visible as an LGBT person is critical to the equality movement. Panelists will discuss how being a role model for future generations can make a positive impact. Learn what you can do as LGBT business owners and professionals to see that the world sees the multiple dimensions of being an LGBT person. Michelle Burkart, Founder & President, Think Business! Understanding how to gain sponsorships is extremely important to organizations. This session brings together representatives from corporations as well as leaders from chambers and business organizations to discuss the right and wrong ways to establish partnerships and ask for sponsorship dollars. This panel will provide differing, yet connected views of how workplace equality is being shaped in today’s global economy. Hear what is being requested of corporations and small businesses as well as what the law is requiring of them. You will also gain insights of LGBT women and men as they transition into the workforce and look to ensure their future employer – large or small, is keeping up with workplace equality issues. What are you doing to see that your community is accessing the multi-billion dollar LGBT travel market? This two part session will explore what you can do to see that your community is vying for LGBT meeting and leisure travel dollars. You will learn from experts what needs to be done to compete. This session gives chamber delegates the opportunity to hear, share and discuss strategies for starting and growing an LGBT chamber of commerce. The session will be interactive and sharing and comparing information is encouraged. Board development, committee structure and the overall operations of a chamber will be discussed. Roz Shakespeare, Founder, Vibrant Group, LGBT Diversity Training Company. 3. LGBT Supplier Education: Get Certified - Get Connected! Are you missing out on the millions of dollars that are being spent with certified LGBT suppliers? This session will give LGBT business owners and entrepreneurs the background and understanding on how to become a certified LGBT vendor to some of the top multi-national corporations. Come hear perspectives from top corporate decision makers and discover how you can expand your business by becoming a certified LGBT supplier. Hear from the most renowned experts in LGBT marketing during this first of a two-part panel discussion designed to educate attendees about the “dos” and “don’t” of attracting this exciting market. Part II of this discussion allows attendees the first-hand opportunity to see what various communities have done to target this exciting and ever-growing travel segment. Learn how local chambers, convention and visitors’ bureaus can team up for success. If you are looking to become a supplier to some of the top corporations in the world, you do not want to miss this opportunity! This event will allow certified LGBT businesses or those businesses considering certification as an LGBT enterprise the opportunity to meet one-on-one with top decision makers from corporations and government entities. Use this time to gain valuable insights on bidding for contracts and to build a relationship with the supplier diversity professionals. Time is money and this will be time well spent! This is Part II of an exciting discussion on reaching the LGBT market. During this session, you will see campaigns that have been successful in reaching the LGBT market and hear from those professional that are responsible for them. Hear first hand how ideas go from concept to full blown ad campaign and what you need to do to ensure it resonates with LGBT consumers. Travis Pagel, Co-Founder, Osmosis Medialab Inc. This panel will discuss the politics of LGBT business. Hear from current and former LGBT elected officials on how best to approach decision makers at all levels of government. You will also learn what the panelists have done to push equality measures in their respective countries. The provocative panel will explore rewards and challenges of being what some call a “double minority.” Panelists will give a candid view of how being LGBT and an ethnic minority, woman or person with disabilities has affected career paths and life choices. You will also gain valuable perspectives on how you can incorporate what you lean into your own diversity business practices. Register online here and save $50 CAD on the International Conference Registration Fee, by using the following Affiliated Member’s Code: 3902. The Delta Centre-Ville will be “Out for Business!” official hotel. To access Tourisme Montréal’s Housing Bureau and book your room, please click here. For more information, please contact Mr. Jonathan Sauvé, First Vice-President of the CCGQ, member of the Conference’s International Scientific Committee and Coordinator of the “Out for Business!” Steering Committee, at + 1-514-522-1885 (throughout North America, dial 1-888-595-8110) or conference.montreal2006@ccgq.ca.